Monochrome: of, relating to, or made with a single color or hue; involving or producing visual images in a single color or in varying tones of a single color (such as gray). Monochrome backgrounds allow the color in your photos to really stand out and make your photos command attention. Create a page using one of these Bright Ideas to tell your story and showcase your color-full life. 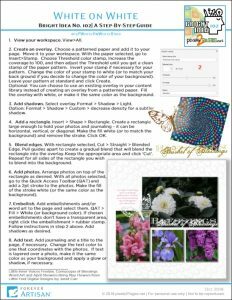 Click the images below to download the printable handouts for these Bright Ideas. These handouts will only be available to the public through the end of the crop. Beginning Monday, February 11, 2019, the images below will link back to the member-only posts. 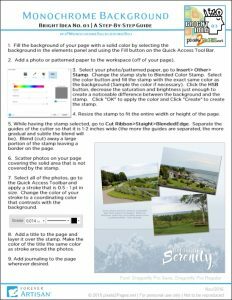 Page must be posted to the pixels2Pages Community Facebook Group before 11:59 PM Eastern on February 8, 2019. The page must be a newly created page using the selected techniques. You can also use the individual hashtags on each offering handout. You can also participate by posting your pages directly into the FOREVER Collaborative Album. You are welcome to add your page to our Collaborative Album even if you posted your page to the pixels2Pages Community Facebook Group. I still don’t see the HSB, where is it? When you select an element and choose fill color, the “color picker” dialog box opens. In the top row of options – at the end is “HSB”. I am stuck on step 3 of the Monochrome background. I don’t see an “HSB” button.